American History -- Liberty Hall Museum - Are We There Yet? Built in 1772 as the home of New Jersey's first elected governor and signer of the United States Constitution, William Livingston, this beautiful mansion was subsequently owned by seven generations of Livingston and Kean families and today is home to one of New Jersey's best kept secrets, Liberty Hall Museum. 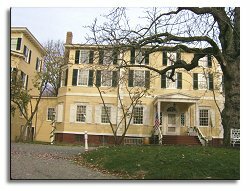 The Museum houses extensive collections of antique furniture, ceramics, textiles, toys, and tools that help illustrate more than 200 years of American history, to which many of the ancestors of the Livingston/Kean family have made significant contributions as governors, congressmen, senators, and business entrepreneurs. Museum visitors will learn the story of this family and the traditions that shaped the greatest nation in the world as they tour the rooms of the Victorian-style mansion that recreate life from the years of the American Revolution through the vibrant times following World War II. The mansion has welcomed many distinguished guests over the years, including George and Martha Washington, Alexander Hamilton, and Presidents Ulysses S. Grant, William Howard Taft, George Herbert Walker Bush, and others. Governor William Livingston considered himself a gentleman farmer when he built Liberty Hall in the 1770's and was proud of the many fruit trees he imported from England and the enchanting formal gardens he cultivated on the estate. Today visitors will enjoy strolling Liberty Hall's eleven landscaped acres featuring century-old trees  five of them the largest of their kind in New Jersey  and the gardens that were restored by Stewart B. Kean. Visit the Museum's official website, linked above, for further details on family tours and special events. One special event families can plan here are Birthday Parties that children will not soon forget. Themes include "Firefighter," with a tour of the Liberty Hall Fire Museum, a real fire truck to play on, plus other great activities and "Victorian Tea," with a tour of Liberty Hall, Victorian period dress-up, souvenir wooden fans, and more. Prices are very reasonable and, with a minimum of 10 children, there is no charge for the Birthday Child. Liberty Hall Museum presents a special opportunity for groups of all ages and interests to enrich their lives or enhance their studies through a variety of special tours and programs. All tours begin with a special 10-minute introductory film. From Crown to Country (grades 4 - 8): Costumed interpreters illustrate the struggles of the Revolutionary era in New Jersey and students will gain insight into the Loyalists, Patriots and Quakers, as well as the role of Liberty Hall and its occupants in the fight for independence. For groups up to 60 students. Changing Childhood (all grades): In this exciting program students use artifacts, reproductions and hands-on activities to explore what life may have been like for children at Liberty Hall during pivotal times of American history: the 1780's (American Revolution), the 1820's (New Nation), the 1860's (Civil War), the 1900's (Industrial Revolution) and the 1940's (World War II). Also for up to 60 students. During the months of October and December students can enjoy a hayride and pumpkin-picking and special holiday tour and ornament-making workshop. An additional fee applies. 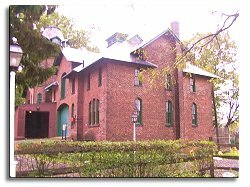 Groups can enjoy a tour of the House, the Garden or both, and groups of 24 or more can schedule a private Tea in the Victorian Carriage House. Call for details and menu or visit the official website, linked above. Hours: Open April through December, Monday - Saturday, 10am to 4pm. Closed Sunday. First tour is at 10am, last tour is at 3:00pm. Closed on New Years Day, Independence Day, Thanksgiving and the following Friday, and Christmas Day. Call to confirm hours. Children 2 and under Free. Garden-only admission is half-price. Guided Tour of Garden costs $5.00 per person. School Programs cost $6.00 and up per student. Prices subject to change. Call to confirm or visit the official website linked above..
Group Reservations: At least 1 week in advance suggested. Lunch: Nearby restaurants. School groups can eat a bagged lunch on the premises. Directions: NJ Turnpike to Exit 13A. Follow signs to North Avenue West to intersection of North Avenue and US Routes 1 & 9. Continue on North Avenue 2 miles to Morris Avenue. Turn right onto Morris and go 4/10 of a mile to driveway just before second traffic light. Turn right into driveway. Copyright © 1996-2014 by Patrick Tadeushuk. All Rights Reserved.